28 September 2004: Regular visitors to Addis Ababa  Amharic for ‘new flower’  will witness the results of major changes: a gleaming new airport; a remarkably clean city, replete with high rises; and construction everywhere. Even beyond that initial realization, local residents will be able to confirm that major changes have swept the city in the 18 months since the government appointment of Executive Mayor Arkebe Oqubay, including a complete reorganisation of the local administration to improve the living and working conditions of its inhabitants, transforming Addis Ababa into ‘The Diplomatic City of Africa’. Very rapidly, then, the Mayor's new policies are being felt right across the city, and  most important  well received by its inhabitants. Addis Ababa has a population of around four million, and an eight per cent annual growth rate. It is, moreover, a very cosmopolitan city, with as many as 80 nationalities speaking 80 languages, and Christian and Muslim communities living together in peace. Most surprising for such a large city is that the crime rate is extremely low, and one feels quite safe walking the streets, even after dark. Addis Ababa has the status of both a city and a state, with a charter endorsed by the national government. One consequence is that the Mayor has responsibilities that are much broader than those of most of his counterparts elsewhere: primary and secondary education, as well as college education, for example; primary health care and health centres, as well as hospitals. Policing, water supply and infrastructure also all fall within his mandate. Addis Ababa’s city council, which is elected directly every five years, provides the Mayor with a cabinet. The cabinet’s role is to assist the Mayor in decision-making. Since attaining office in early 2003, Mayor Oqubay has been aggressively overhauling the city administrative system with the intention of rendering it much leaner and less centralised. When he arrived, there were 40,000 civil servants and four tiers of bureaucracy. The number of tiers has been halved, and the civil service is also being thinned out. Addis Ababa now comprises 10 municipalities, each representing around 400,000 inhabitants; 90 per cent of services are provided at municipality level or lower. These municipalities are afforded a great deal of freedom: for example, they can set their own budgets. Governance, however, primarily focuses on the kebele, or neighbourhood, of which there are 10 in each municipality, each consisting of roughly 40 to 50,000 inhabitants. This two-tier system is not only leaner, but more democratic, and an elected council in each municipality makes decisions. The kebele also have their councils, and they can decide whether to focus efforts on and tailor budgets to high schools, primary schools or health facilities. The Mayor wants people to be involved in their kebele, and these councils appear an excellent way of achieving that aim. Mr. Oqubay has also created institutions that did not exist before his appointment: for example, for housing and street cleaning. Although he could easily have laid off up to 10,000 civil servants, he has preferred to reassign them to these new institutions. Determined to recruit top managers, he studied the experiences of other cities. Within six months of his taking office, the restructuring was complete. Among Mayor Oqubay's highest priorities is delivering services to residents and local businesses. Under the previous administration, many of those procedures were paralysed by bureaucratic red tape. That has changed. The waiting time for birth and marriage certificates, for example, has been cut from three long weeks to 30 minutes in a one-stop service; tax registration, from a hefty six months to one hour; land registration from a business-crunching three years to eight days (and may soon be cut to as little as three days). Also, a major effort is under way to eradicate administrative bribery, and the Mayor has fired over 1000 corrupt civil servants. The new waiting times have been achieved by introducing new management practices and tools, with outsourcing as a prime example: revenue and tax are collected through banks and post offices, and car technical inspections are being conducted by private businesses instead of by the city directly. A further aim of the City Government is transparency in government through the regular publication of press releases and media statements in newspapers and on TV. The Mayor is also committed to the swift handling of complaints. Mayor Okubay admits that unemployment is his biggest economic challenge, with the current rate standing at 42 per cent, and 60 per cent of employment classified ‘informal’. The Mayor aims to tackle this problem by encouraging micro and small enterprises. He has, as already noted, cut red tape and reduced investment bureaucracy, and he has established industrial zones where investors can buy land more quickly at lower prices. The Mayor aims to create jobs in five core areas: food processing; the textile and garment industry; metalwork, woodwork and furniture production; small construction; and municipal facilities. He has created the Micro & Small Enterprises Development Agency to provide credit, training and assistance to these new businesses, as well as Business Development Subsidies (BDS), Technology Improvement and marketing. The scheme has already helped create 63,000 jobs. Further, the establishment of 45 new private parking lots has created over 3500 jobs and, as an example of his outsourcing policy, brought in new revenue in excess of 7m Birr (the Ethiopian unit of currency). Mayor Oqubay's next big economic challenge is housing, with over 300,000 homes needed. He correctly sees homelessness as a major problem, and it is one he is determined to solve. The current housing stock, in addition, is hopelessly old and overcrowded. People who are willing and able to construct their own homes are offered an incentive in the form of a gift of up to 50 square metres of land. The Mayor is adamant that these people should become owner-occupiers, and not tenants. In this way they are able to become financially more independent, such as by using their property as collateral to enable them to secure loans to set up their own businesses. In this way the Mayor hopes to augment the middle class in Addis Ababa. Incentives have been offered to property developers who want to construct housing for low income families. Housing policy, the Mayor maintains, should favour the impoverished, and he realises that his target of constructing 200,000 houses in the next five years is ambitious. If Mayor Oqubay seriously want to solve some of his city’s problems he will have to dramatically increase tax revenue. 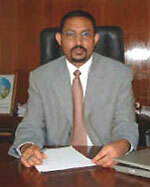 Addis Ababa does not receive any subsidies or grants from central government and the banks are unwilling to lend. The Mayor hopes to treble revenue by improving tax collection. The new programme includes making it easier for people to pay their taxes, as well as the introduction of automated tax collection and the training of staff. The Mayor has already had some success. Tax revenue has risen from $100m to $200m. However, there is still a long way to go before his target of $500m is reached. A further challenge to the Mayor is Addis Ababa’s environment. Great improvements have already been made. The city is cleaner, and many local residents comment to that effect. Credit is due to the newly established Cleaning and Parks Development Agency. In keeping with his neighbourhood governance philosophy, the Mayor wants to make all residents aware of the importance of a clean city, and that their active involvement can make a difference. The Mayor wants to make Addis the continent’s cleanest capital, befitting its status as the African capital. Mayor Oqubay's top social priority is the prevention of HIV/AIDS, and to that end he has established 68 Visit Centres providing counselling and testing. Further, 13 million condoms have been distributed; the aim is to increase the number to 25 million a year. He believes that leaders should set good examples; therefore, he decided to take the HIV test himself with the media watching. After that widely publicised event, the take up rate of the test increased by 400 per cent. He has also set up prevention councils, comprising faith groups, the private sector, NGOs and the kebele, as well as community associations. The prevention councils are a way of involving as many people as possible in the prevention of AIDS and, as any visitor will testify, it is an issue that is now being constantly addressed on the street, as well as in the mass media. In addition, Youth Clubs have been organised to target the 550,000 students who study in Addis. With 40 to 50 per cent of hospital beds currently occupied by people with AIDS, the Mayor aims to promote a home-based care project, along with an extensive training scheme. Sufferers should thus be enabled to remain in their own homes within their kebele, whilst also freeing beds in hospitals. Education is extremely important to Ethiopians, and the Mayor admits that education provision in Addis is poor. While he claims that 93 per cent of children receive primary education, the figure drops to 37 per cent when it comes to secondary school. To improve education provision, Mr. Oqubay wants to phase out so-called multiple shift education, where students are taught in shifts because of too few classrooms. Construction of 5,000 new classrooms and cutting of class sizes by half, from 100 to 50, by engaging more teachers are seen as the answer. School boards have also been created in order for both parents and teachers to become more involved. Addis has cooperation agreements with cities such as Johannesburg, South Africa; Beijing, China; Gaborone, Botswana; Leipzig, Germany and Lyon, France. These collaborations, the Mayor emphasizes, must not be merely ceremonial, but of some material benefit to Addis and its residents. Also of particular importance to Addis is collaboration with cities such as Washington, DC and Atlanta in the USA, which have substantial Ethiopian communities. The Mayor hopes to convince expatriates, who have succeeded abroad, to take up investment opportunities in his city.